It's October 1st today, and I just finished a Halloween project! My project started with the purchase of these 1977 Burwood owl plaques that I purchased thrifting for $3. 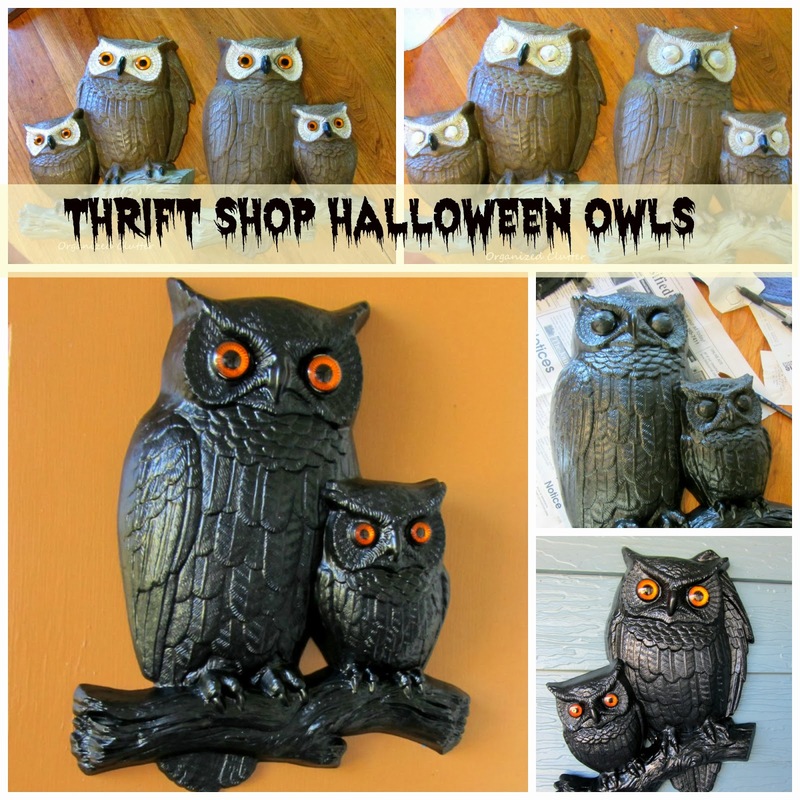 They are 3d molded or formed plastic, and this type of plaques and the owls too were popular back in the 1970's. I really liked the orange and black eyes. I thought they would give the owls a Halloween look. I used masking tape to protect the orange and black eyes from spray paint. I applied two coats of Rustoleum black spray paint. And on my side garage door. I think my three dollar owls look like Halloween owls for sure! More Halloween decorating to come! Holy Canoli! You find the best stuff and do the greatest "make-overs" on whatever it is. The owls are a hoot! LOL! Love the owls!! A great find! Oh..my! these turned out so great! Spoooooky! I love the eyes, too. I saw a clock to match at our thrift store last week. Love the owls...they turned out great!! Much better after painting and so perfect for Halloween!! those were so bad before! and I love that instead of painting them white and making them good, you made them creepy and perfect for Halloween! great vision! Your Halloween owls look great, Carlene. The black paint really makes their eyes pop.